Almost the entire staff has driven the Cadillac ATS-V and I think, individually, there isn’t a single person who hasn’t enjoyed it. But when it comes to the track it always helps to send a ringer, and our ringer is none other than racer and occasional hoverboarder Robb Holland. 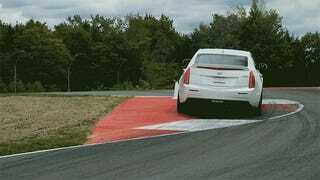 Watch Robb Holland (and briefly Chris Duplessis) rip the crap out of the ATS-V at Monticello Motor Club. His review of the car is coming soon.